Wickham Market station is based in Campsea Ashe and has been an important part of the village for many years. At one time over 20 people worked at the station and there were two lines rather than the current one, together with sidings and many railway buildings. There was even a W H Smith bookstall! 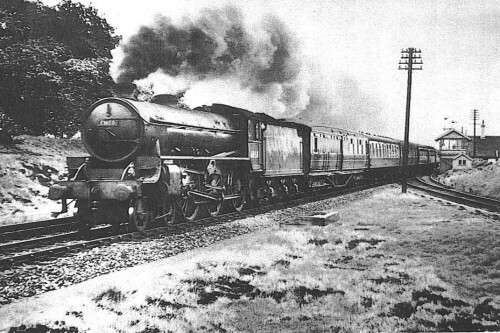 • completed in 1859 – services running from 1 June - with branch lines to Framlingham, Snape (goods only) and Aldeburgh. These branch lines were closed in 1965, 1960 and 1966 respectively, though goods trains continue to use to the line to Leiston & Sizewell to serve the nuclear power station. • formed the link between the Liverpool Street – Bury St. Edmunds & Cambridge lines, and the Halesworth, Beccles & Haddiscoe lines, finally to provide an alternative east coast route to Lowestoft and Great Yarmouth. • instigated by the 1855 East Suffolk Railway Company Prospectus of Sir Samuel Morton Peto, under the chairmanship of the Earl of Stradbroke, and to be funded by a number of prominent local dignitaries. Sir Samuel Peto was already the proprietor of the Halesworth, Beccles & Haddiscoe railway and wished to extend his interests. • The topography of the line from Woodbridge is flat to Melton (roughly at sea level), then a fairly shallow rise climbing along the edge of the Deben river valley beyond Ufford, past the grounds of Loudham Hall and Ashe Abbey, arriving at Wickham Market (Campsea Ashe) station at a height of 25 metres (80 feet). From Wickham Market the lines levels down to 15 metres or so (50 feet) along the Ore/Alde river valleys before rising beyond Snape to reach Saxmundham at about 20 metres (65 feet) above sea level. 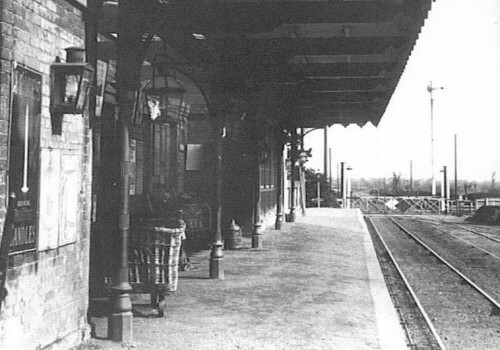 • In its heyday Wickham Market Station (sign-boarded “Wickham Market for Campsea Ashe”) was dual track, with an up-line and a down-line - each with its own platform - a signal box and numerous sidings and goods facilities. Services for passengers included a ticket office, waiting room and bookstall, and the nearby Talbot Hotel. There was especially ample provision for loading goods and livestock to and from the agricultural hinterland, and even ramps for military vehicles during the Second World War. Some vestiges of this infrastructure can be traced today. • The road originally passed over a level-crossing just to the north of the station, but this was replaced by a bridge in 1902. The present bridge is a replacement constructed in 2005. Why is Wickham Market station in Campsea Ashe? (ii) the degree to which the River Deben flooded around Wickham Market. The railway line runs north-east between Ufford and Eyke, and along the edge of the Deben valley to Campsea Ashe. The route chosen avoids both the climb up to the higher ground on which Wickham Market lies and the surrounding river flood plain to the north and east of the town. However, in the 1850s and 60s, Wickham was the next largest and better known population centre north of Woodbridge, with markets and light industry catering for its agricultural hinterland, and so to the chagrin of Campsea Ashe villagers, the station misnomer was retained. Dan Poulter MP calls for better railway service, January 2017.